I’m too time-crunched this morning to write my own thought-out post on this, so I’ll just quote the Angry Asian Man (to whom I owe a hat tip). This week, finalists were announced for the 60th annual National Book Awards, the prestigious literary prize presented to exceptional American books written and published in the last year: Finalists Named for National Book Awards. There are five finalists in four categories: fiction, nonfiction, poetry and young people’s literature. 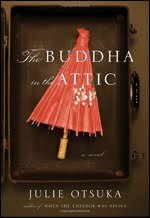 What’s noteworthy is that the short list for fiction includes Julie Otsuka’s The Buddha in the Attic, a fictional retelling of the postwar Japanese American experience. This book sounds like one to definitely consider adding to your reading list. And congrats to Julie Otsuka!